If you're looking for a place to worship during your time in the Manistee area, click here for a sampling of churches from all demoninations. Visitors to Manistee can now fly into Blacker Airport. Their brand new terminal, dedicated in 2007, features a large passenger area, viewing area and visitor lounge. PublicCharters offers airline service with a 60-minute, non-stop flight to Midway Airport in Chicago. Departures are at 8:30am Monday, Thursday and Friday, and 4pm on Sunday. Arrivals from Chicago Midway are at 7pm Sunday, Monday, Thursday and Friday. Read more about other nearby airports and transportation options. The Manistee County Library is a busy place all year long. 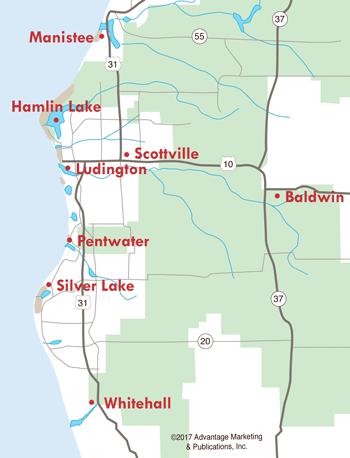 In addition to the main library on Maple Street in Manistee, they have five other locations--Wellston, Kaleva, Arcadia, Bear Lake, and Onekama. Kids love the library for their Tuesday morning Story Time. The Children's section offers books, educational toys, DVDs, CDs, and audio books. School-aged kids can get homework help at the library in a variety of subjects. You can use one of the computers or bring in your own laptop and access the internet. Other services available are tax forms, faxing, plus books on cassette, CD and MP3. Located on Parkdale Avenue north of Manistee, West Shore Medical Center is a 25-bed facility that is staffed by 40 primary care and specialty physicians. Clinical services include cancer treatment, emergency and surgical care, women's and children's services, cardiopulmonary care, radiology, and home health care. Click here for other Manistee medical services. As you're moving into your new home, one of the most important things is getting hooked up to all your utilities. Manistee has a variety of providers for electricity, gas, phone, internet, cable/satellite and cellphones. Click here for a complete list to get you "connected" as quickly as possible. Finding a bank you trust and feel comfortable with is of prime importance. Check out Manistee.MichBiz.com to find a financial institution that will get you started on setting up your new accounts. Loans, mortgages, CDs...you can feel confident your money is safe and in good hands.